Stay tuned people! New single ALIVE released Friday! So much has transpired since the last EP. The biggest being that Pablo moved to Spain. The decision was equally as difficult for Pablo as it was for the rest of us. We all took an unplanned break to come to terms with the circumstances and to take stock, and maybe figure out our next move. As such Cursing Stone has decided to move in a new direction, focusing more on being a recording project. We all agreed that Pablo is the cornerstone of our sound and we strongly believe that without his input, we just aren't Cursing Stone any more. So never fear, your favourite Aussie female fronted act will still be producing music (business as usual) we just won't be playing a lot of shows. We have transitioned from a hard working, live rock act, to an international recording project! Pretty cool huh? Stay Tuned. We have something coming up for you, real soon! You saw it here first! Coming very soon.. The 28th of March marked the first show Cursing Stone had ever booked independently. There are many reasons we decided to book our own show, but mostly we just wanted to test the waters and not settle for whatever shows we could find through booking agents and promoters. The Valve Bar do an amazing job making their venue available for live music with a minimum of fuss, something that is incredibly lacking in Sydney of late. We put on another four like minded bands and the rest is history. The show was fantastically successful, with each band really shining in their own style. Like all independent, original shows, it was a challenge, but if anything, this show was living proof that you can put on a show in this city and have wonderful people show up and enjoy the musical art that this town has to offer. The guys had a blast crushing it at The Stag last night as part of Strut! Thanks to all our friends who made it out. It's your support that makes the late nights and countless practices worthwhile. Cursing Stone tore through he roof off the Bald Faced Stag yet again tonight securing a spot in the Grand Final of Strut! The band we're honoured to make it through this round, beating out an incredibly impressive lineup. Now its on to the Grand Final! Looking forward to a big writing session in the studio tomorrow. Below is a clip of Cursing Stone being featured on Triple M Homegrown, a nationally broadcast radio show featuring Australian artists. The host, Ugly Phil gave us a pretty good rap, and used our track to close out the show. The band is pretty psyched about it as it's our first national broadcast. Now we have a story about where we were the first time we heard ourselves on the radio! Cursing Stone on Triple M!!! Today we got an email from Triple M's Ugly Phil letting us know he will be featuring our song Stars on his Homegrown show on this Sunday 10th Aug (From 6PM). This will mark the first time Cursing Stone will appear on a nationally syndicated radio show! Four's company, five's a band! 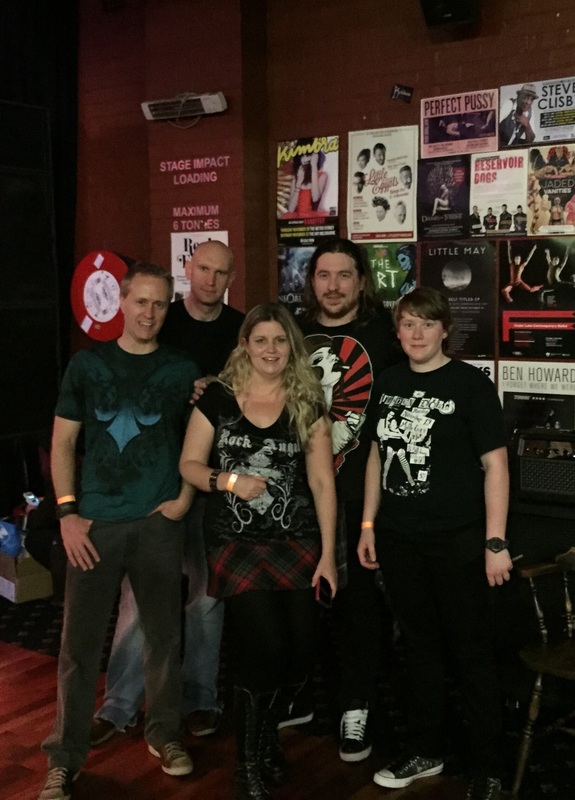 Cursing Stone would like to officially welcome our new keyboard player Clare! Due to a growing rift developing between our studio production ideals and our performance capabilities as a four piece, we had two possible directions. Play to a backing track, or add a keyboard player. Playing to a backing is extremely awkward when moving between venues with different production requirements, and does not allow for flexibility in arrangement etc. So having an extra member was the obvious choice. Clare brings with her a wealth of experience and already our music is evolving toward a much richer and dynamic sound. Stay tuned for upcoming gigs to come and check out the new Cursing Stone. So we are all back in Australia and it's business as usual. Working hard to put the finishing touches on the new album. Watch this space. Pic of Nat living the life at the most historical rock and roll bar in Hollywood. The Rainbow Bar and Grill. You heard it here first... literally. In honour of our new album sampler we thought we would post the next single early. Keep an eye out for it's future release via all good digital distributors. With a big promotion drive on the horizon Cursing Stone has produced a short run of album samplers with the first 4 tracks, including the first two singles. If you would like a copy, hit us up via the contact us page. 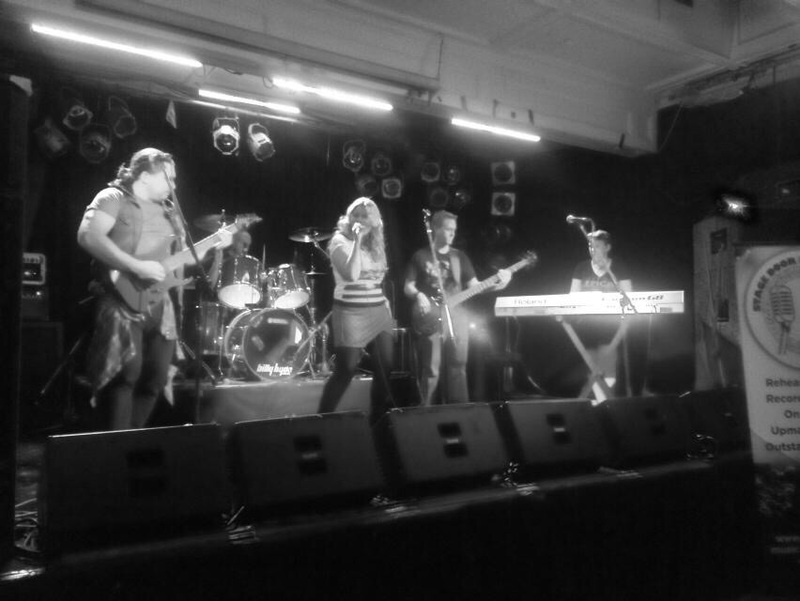 Last Friday night Cursing Stone laid waste to The Bald Faved Stag in Sydney. It was a great night with some old friends and more than a few new ones. Thanks everyone for stopping by. We just wanted to say a huuge thank you to everyone who has liked, linked or shared our iTunes link and music video link over the last few days. We are popping up all over the net on social media. It really means a lot given the months of work that went into the clip and the production if the track (and album). Best wishes to everyone. It's finally here. Stars by Cursing Stone. Watch it, Like it, Share it! We appreciate your support. Also available on iTunes! click the cover below. Cursing Stone's new single Stars is counting down to release. There are a few final touches being applied to the video, and once completed the track will be unveiled world wide. This is the artwork. Stay tuned for the final release. Natalie has just wrapped shooting on day two of the Stars video shoot. Today was mostly about narrative shots, and the production was taken out to an undisclosed location to get some great practical interior and exterior coverage. With editing well under way it shouldn't be long before the release date is announced officially.